I was diagnosed with BPD in 1991. My life was chaotic but I somehow made it through year 12. Thinking back, I can clearly remember how absolutely desperate I felt. It seemed nothing was satisfying and every attempt to find meaning or enjoyment ended up in depression, self-harm and hospital with a feeling of failure with every turn I took. Those years were exhausting to the point where it was just impossible to have the energy for the ‘recovery’ that was the growing focus in mental health in Australia. I had, and still have, my vices. I have always liked my solitude to think and listen to music quietly; a time to process the world and my role in it, assess what I could and couldn’t change, what I could cope with and with what I couldn’t. Just when I think I have worked it out, it all changes. I now realise that is part of life and my BPD restricted me from being open to learning resilience and rolling with life and all it throws at you and offers you. Learning to reflect and process situations, events and interactions, gave me insight and new ways of being; and no, I didn’t learn this alone. During my hardest years, there were a number of clinicians and the odd family member who stuck by me, sharing the hope of what my life could be and would be. Without them as my patient cheer squad, I really don’t think I would have survived as they were always there through the good times and bad, sharing endless options and mentoring with responses not reactions, kindness not impatience. At a critical time in my recovery came a rescued Labradoodle called Crumpet, who took the focus off me as she needed all the care I could possibly give. The opportunity arose to have her trained as a mental health assistance dog and although this came at a cost both with time and money, it was something I wanted to try. We succeeded a couple of years later and bonded at the same time; healing us both from our past and moving toward a more exciting and fulfilling future. With that came opportunity. be like. 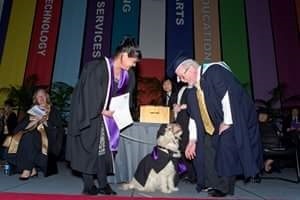 With a whole new change in perspective and the world opening up, I was able to enrol in a Bachelor of Social Work as a pathway, with Crumpet in tow. I can say now that this part of my life was the best I have had so far. The course, the trip to India as part of an immersion experience and finally graduating as a social worker and valedictorian; I finally came to the realisation that yes, I was recovered and actually leading a pretty good life. It is six years since I graduated as a social worker. I have had some amazing jobs that have taken me as far as Nauru and I now work in the mental health sector myself. When I look back on my period living with the distress of BPD, it could easily be with regret but it is BPD that makes me the person and the social worker I am today and without BPD I wouldn’t see as clearly as I do now.